After the tragic school shooting in Parkland, gun control advocates wearily prepared for the identical cycle of public discussion that happens after every mass shooting. 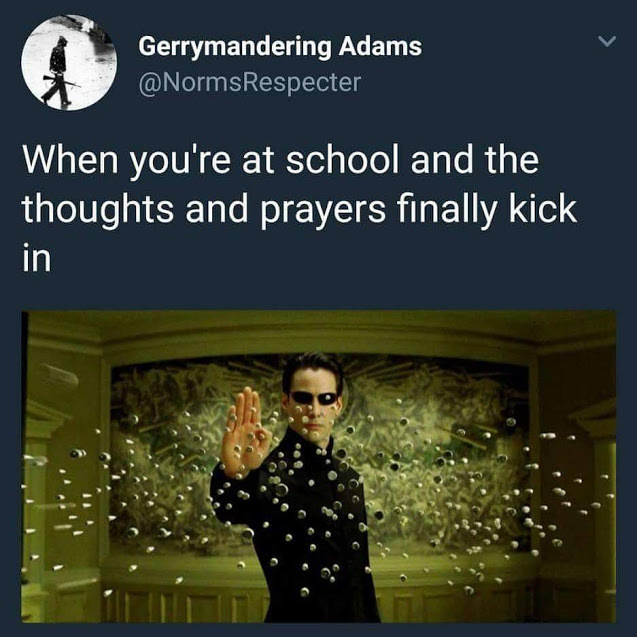 Politicians would offer their much-mocked "thoughts and prayers" for the first few days. Then the vicious and unproductive online arguments, which involve the exact same arguments every time, would begin between gun control advocates and right-wingers. Democrats would filibuster and speak passionately on the Senate floor, but a vote on anything meaningful would fail to happen. Something was different this time. This time the survivors spoke out. 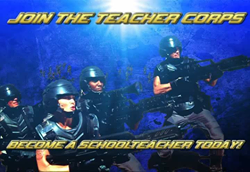 Normally the survivors of mass shootings try to be apolitical for various reasons. Some think it's disrespectful. Others are grieving and not in the position to take political fire. Still others are jaded and have lost all hope that Congress would do anything. The kids of Parkland, however, were different. They watched their friends die after hearing about other shootings on the news and realized that this had happened before and the government could have done something. Their friends didn't have to die. 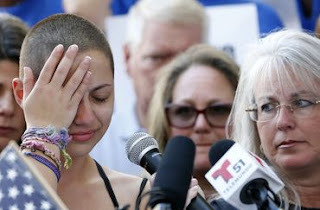 So, despite their grief and trauma, the kids of Parkland stood up and hurled themselves into the firestorm that is politics. They are uniquely positioned to be extremely effective activists. They do not share the cynicism of the adults and know that if they act then action can happen. They are extremely motivated for obvious reasons. In the political arena, their experience gave them credibility and as trauma victims shielded them from some vicious political attacks. We see evidence of their effect. It's been ten days since the shooting and by now the conversation is winding down. Not this time. Recently President Trump hosted a public conversation with the survivors and CNN hosted a town hall where the kids publicly confronted politicians. The Oregon State legislature passed a bill banning domestic abusers from buying guns. 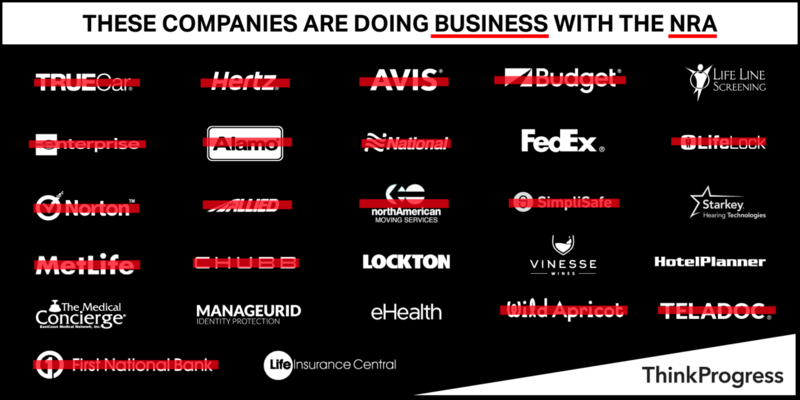 Most significantly, businesses have begun to announce they would no longer give NRA members benefits as part of the #BoycottNRA movement. 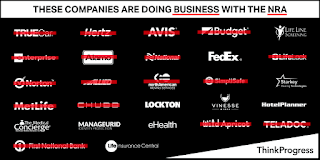 The crossed-out are businesses who renounced their sponsorship programs. Part of the NRA's power is its five million members, the NRA's foot soldiers against gun control across the country. The NRA collects membership fees, which it uses to lobby and influence politicians in Washington. One of the reasons members join the NRA is that NRA members get benefits. For example, the Bank of Omaha offers NRA members a special credit card that gives them cash back on gas and sporting goods. Various other companies offer benefits. Recently, companies have began to dissociated themselves with the NRA and stop offering benefits citing public outcry. However, the public response has also been remarkable for its viciousness. Mainstream Republicans like Donald Trump Jr have accused the kids of speaking scripted lines. Some have started calling the kids "crisis actors." Conservative pundit Dinesh D'Souza mocked the kids. Speaking of the online front, there is now a renewed pushback against right-wing gun rights arguments. 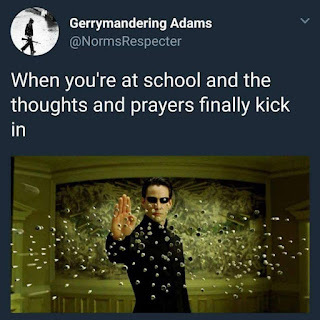 Memes, which normally lean to the right after mass shootings, now mock "thoughts and prayers" and the proposal to arm teachers. Where the adults have failed us, the next generation will not. You may remember your favorite websites, from YouTube to Reddit, being filled with petitions to save net neutrality. 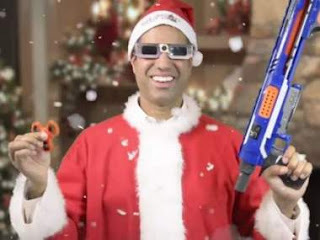 Despite this and other protests, on December 14, 2017 the Federal Communications Commission (FCC) voted to remove the regulations that prevented Internet service providers (ISPs) from discriminating between web traffic. Now most of the hubbub has died down. The older generation would attribute this to the Internet's short attention span. However, this is not the last battle! 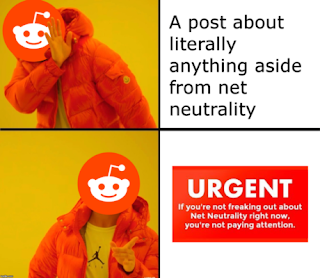 Comcast and Verizon would love for people to give up and go home, but people need to know we still have multiple ways to try and save net neutrality. There was an overwhelming flood of net neutrality posts on Reddit. To put it simply, ISPs like Comcast used to slow down or block websites as they wished before the FCC under the Obama administration passed rules classifying the Internet as a Title II utility under the Federal Communications Act. Before that, Comcast, for example, could speed up the Internet for its own apps but slow down or block its competitors' apps (as they did once). AT&T could block political websites, the way they blocked a union's website when that union went on strike against AT&T. In other words, the ISPs could act like a mob cartel: demanding bribes and threatening businesses that didn't bow to them. But what does this mean for you? If you or your family work at Silicon Valley, an end to net neutrality could stifle startups. Much like crony capitalism, starting businesses would be hard without the initial capital to pay a bribe, in this case to the ISPs. Even if you don't work in the tech industry you have much to lose. Political free expression online could suffer. Even if you're conservative, keep in mind that Comcast was a major Clinton donor and has little to lose if they wanted to block right-wing views. This is precisely why many conservatives support net neutrality. 21 states are suing the FCC in the US Court of Appeals, where they filed a petition so they can have a spot for a hearing. They say that the FCC didn't do enough to get public input on the decision. Many of the comments left on its website turned out to be faked. One part of the new anti net neutrality rules bans states from setting up their own rules. The public was never asked about this, so they can argue the rules are thus invalid. The states can also say the FCC doesn't have the authority to ban states from passing their own net neutrality laws. Many states are also passing laws that would ensure net neutrality within their own state. Washington did just this recently. Some are even allowing cities to set up their own ISPs that would be completely independent of Comcast or AT&T and would practice net neutrality. Others have governors who signed executive orders to save net neutrality, including Hawaii and Montana. Unfortunately, the FCC is federal so its laws apply nationally, so it has the power to trump lower states' authority. This too would be decided by the aforementioned lawsuit. Congress also has the power to act. By the Congressional Review Act, they have the power to overturn the FCC's decision. Net Neutrality would come back, and there will be no need for the states to pass their own laws. There is a bill to do just this. It has the support of all the Democrats in the Senate and one Republican, (R) Sen. Susan Collins of Maine. This comes out to fifty votes for to fifty votes against. In this event VP Pence would break the tie, and he will likely vote no on the bill to stop the FCC and bring back net neutrality. The House of Representatives also has a bill to do this, but net neutrality advocates face a daunting path as Republicans dominate that House. Even if the House of Representatives and the Senate passed a net neutrality bill, President Trump would likely veto it. All in all it's unlikely, so we have to rely on state governments to see what happens.